I never know what to do before races. Usually, I find a curb to sit down somewhere and just think. Of the course ahead of me. Of how my body will feel at various check points. 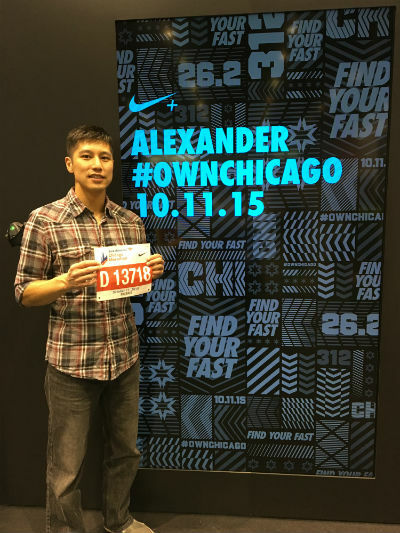 On October 11th, I found myself packed in a corral of the 2015 Chicago Marathon. And the main thought going through my head was - what am I doing here? 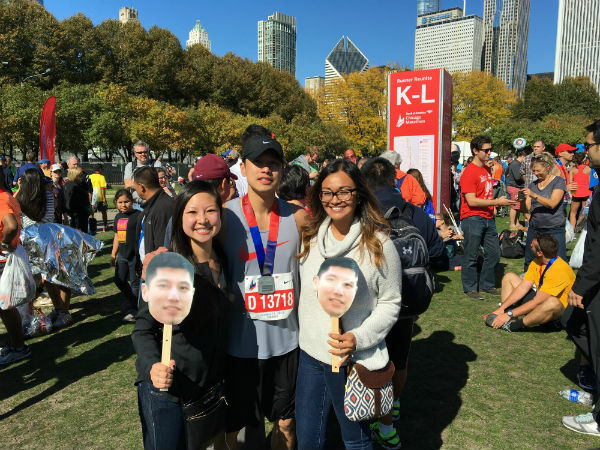 Here’s a recap of my incredible Chicago Marathon experience. We landed in Chicago Saturday morning and took an Uber to our AirBnB. Embrace the sharing-economy! 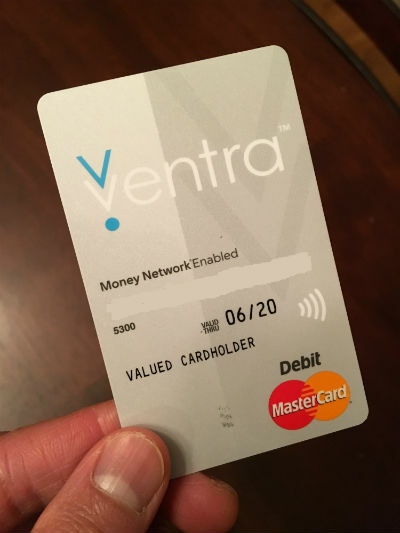 We checked in and went to the nearest Red Line to pick up 3-day Ventra passes for public transit. I go kind of crazy when I hear the word unlimited, so the passes did a lot of work over the weekend. Normally, I like to relax and be off my feet before a race. But this was Chicago and we weren’t wasting it. So we walked, explored, and did touristy things the whole day. The highlight for me was the Chicago Architecture Boat Tour. Basically, you cruise along the Chicago River while a docent talks about the city’s architecture, history, and current urban planning. Our guide was very knowledgeable and made the experience fun, yet informative at the same time. The views from the boat were spectacular. My favorite was a building currently under construction. 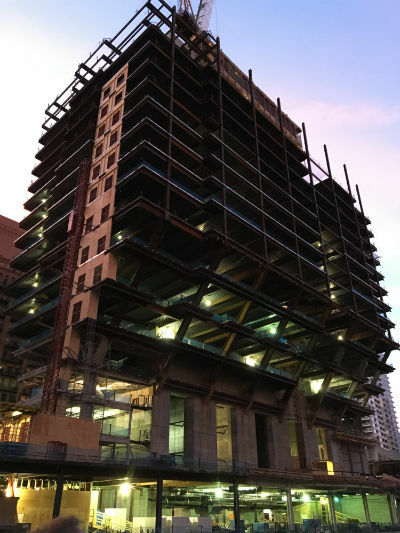 There was limited room at this location for a standard-sized building, so the architect designed the base to fit along the waterfront and simply expanded the upper levels. Ingenious. We stopped off at the expo late Saturday afternoon. With over 45,000 people registered for the marathon, I was prepared for a huge cluster mess inside. To my surprise, it took less than 10 minutes to check-in and get my bib-packet. Talk about smooth and organized! The next step was signing up for a pace group, something I had never tried before. They informed me their strategy and how water stations were handled. They even provided pace tattoos and an extra bib you wear on your back which designates which pace you’re “supposedly” running at. With business taken care of, we checked out the various booths and exhibits. I picked up a hot green singlet at the Nike zone. There also was a neat area set up that displays your name on a screen when you scan your race bib. The initial plan was to run with the 3:55 pace group. In my previous marathons (4:05 and 3:58), I had bonked and cramped miserably. So 3:55 seemed reasonable, especially since I didn’t want to limp to a finish again. When the volunteer at the expo asked me which pace group I’d like to run with, I YOLO’d and replied 3:50. This was a huge difference in time, and probably foolish. But Chicago was a bucket-list race and I didn’t want to leave with any regrets. Hence, the new plan was to run the race by feel and use the 3:50 group as a “rabbit”. If they pulled away, fine. I’d hang on as long as I could. The ideal scenario was to keep them in striking range for the majority of the race, and chase them down at the end. Race day! I woke up around 5am and had a bagel with peanut butter and a 32oz Gatorade. In hindsight, I should have eaten more and drank less. 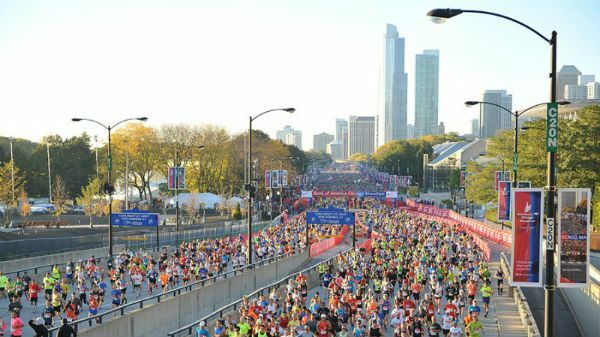 The bus to Grant Park filled up quickly with runners. The mood was quiet and reflective. I didn’t have a drop bag so it was a breeze to get to the start. The weather turned out as predicted. 12-17 mi/hr winds. A bit of chill in the morning, then warming to mid 70’s rapidly. The Event Alert System level was YELLOW, which meant racing conditions were not ideal and to be careful. I found the 3:50 pace group in my corral and we bonded instantly. We made jokes. Shared nervous smiles. We all had a common goal, which united us in a strange way. The race is kind of crazy at the start, with everybody going out too fast and general chaos everywhere. 1/2 mile in, we go into a short tunnel and a bunch of people are relieving themselves on the side. I shouldn’t have drank so much Gatorade.. I know that’s all I’ll be thinking about so I join the others. When I finish, my watch shows my average pace at 10:18 min/mi. To make matters worst, I don’t see the 3:50 pace group anywhere ahead of me. It takes a couple 8:05 splits to catch up to the pace group. I hope this doesn’t come back to haunt me later.. Feels great to run with the group again. Try to calm myself and settle in, adrenaline is high. The crowds are insane. Even though my iPod is turned up, the roars from the spectators drown out my music entirely at times. My GPS watch goes bananas early, probably from the tunnel or high-rise buildings. I can’t trust the accuracy so I give up on it and resign to run the race naked. It’s decently windy in this section. I do my best to tuck in behind the pack and conserve as much energy as possible. Chocolate GU at mile 5, yum. 10k down, that was fast. The pace seems oddly easy, although how many people have had the same thoughts before gloriously hitting The Wall.. The pace leaders are amazing. Each mile, they check their watches and I hear “8:46, nice” or “8:48, right on schedule”. How they can run within seconds of target pace is beyond me. They chat almost the whole time, likely to keep everyone’s mind off the pain to come. The only issue is how fast they cruise through aid stations. My first attempt to drink while running ends with Gatorade all down my face and shirt. I walk each station after. Which means every 1.5 miles or so, I lose the pace group and have to slowly catch up. Feeling loose and relaxed at this point. Enjoying the race and the crowd, have never seen cheering like this before. Still in awe at how many people are out watching. At mile 10, I wonder if I should switch gears. I throw out a quick surge. Feels nice to stretch the legs, but it’s way too early. I pop another GU and sullenly retreat behind the group. We reach the halfway point at 1:54:39, about 36 seconds ahead of schedule. The group has thinned out a bit, but I still see a couple familiar faces. I’m chilling in front of the pack when one of the pace leaders starts saying how great this race is. How well we’re doing. How this moment is something we should remember forever. 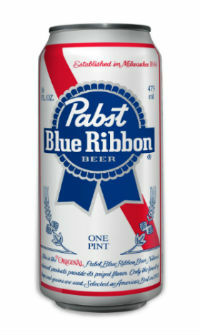 Then, out of thin air, he pulls out a 16oz Pabst Blue Ribbon. He asks who will be the first to drink. Everyone is silent, probably from shock. One guy finally volunteers and takes a swig. Who’s next, the pace leader asks. Oh why not. I cup my hands and he pours a generous amount in them. I slurp every drop of the delicious liquid. So this is what unicorn tears taste like. I’m pumped up now, which is good because we’re pretty much heading straight into the wind. The pack is providing some nice shelter. GU at mile 14. Stuffing my face with all the calories now. It’s starting to get hot. I leave each aid station with 2 cups of water - one to pour over my head, and one to splash on my face and body. A quick body scan at mile 16 shows no major signs of cramping or tightness. Body feels solid and energized. I make the decision to drop the group. It’s go-time. At mile 18, I stop for water and my heart is crushed when I see the 3:50 pace group run past me. What just happened? My pace must be slipping.. I catch back up to the group and reassess the situation. The good news is I haven’t cramped yet. It’s the farthest I’ve ever gone without cramps. The bad news is I don’t know how long it’ll last. The sun is out and the heat is a major factor now. I try to stay cool by running on the shady side of streets and through any fire hydrants or sprinklers. Hamstrings and calves are getting tight. I almost pull one, but I adjust my form and push the tremors down. I know I have two gears left if my body holds out. I prepare for another surge. No chances this time, pace group. I hit the NOS at mile 20. Hammer out splits of 8:05, 7:57, 7:54. When I get to Chinatown, I know I’ve got this race. The only question is what the finish will be like. My stomach feels like garbage. I have so much GU and liquid in me I stop taking fluids. At one point, I actually vomit a little Gatorade in my mouth and force it back down. Oh well, 2 for price of 1. I start to see people off to the side stretching out cramps. Many are limping. There is carnage everywhere. Around mile 23, I turn on Michigan Ave and see tall buildings straight ahead. That’s where the park and finish is, along with my free beer. I fly down Michigan Ave, picking off runner after runner. I even catch a few 3:45 group members. 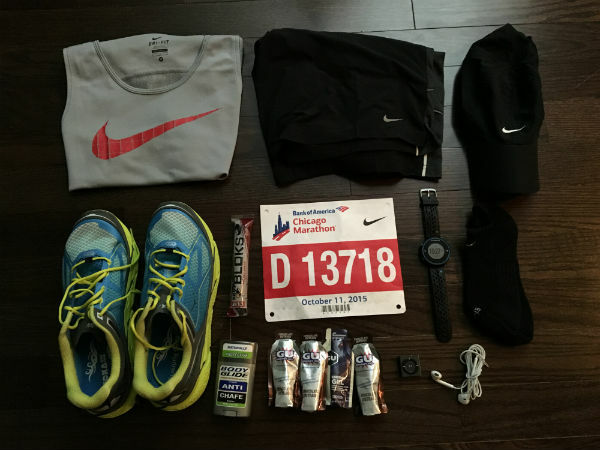 At mile 25, I unleash my final gear – Beastmode. Everything hurts but I tell myself if I stop now, it will hurt forever. At mile 26, I see signs for 800m and 400m remaining. I prepare myself for the dreaded uphill many people warn about at the end. I sprint to the finish, smiling the entire way. I cross the tape at 3:45:45, a 4 minute negative. Never in my wildest dreams did I believe I could run this fast. My last 1/2 mile splits end up being 7:49, 7:25, 7:11. I get my medal and almost cry. What a journey. It was worth every second of pain and more. Since the finish is packed with spectators, I make my way to the designated area to meet up with my support crew. I scan the crowds for a familiar face, when out pops my head floating on a stick. Of all the races I’ve run so far, Chicago is on a whole other level. It isn’t just the top-notch organization or massive energy from the spectators. The entire city hums with excitement and electricity that weekend. It makes you want to run even more than you already do. The volunteers and event crew do one heck of a job in making the event special. I can’t praise them enough. Everyone was so nice, encouraging, and helpful. Running with a pace group was great! I would definitely do it again, especially if the pacers were anything like the 3:50 group. It’s absurd how accurate their splits were. They knew the course very well, down to the best paths to take for maximum shade. The course is pancake-flat and very fast. This was my first race outside Colorado and it felt weird to run that far of distance without any elevation changes. It’s a unique experience if you aren’t use to it. 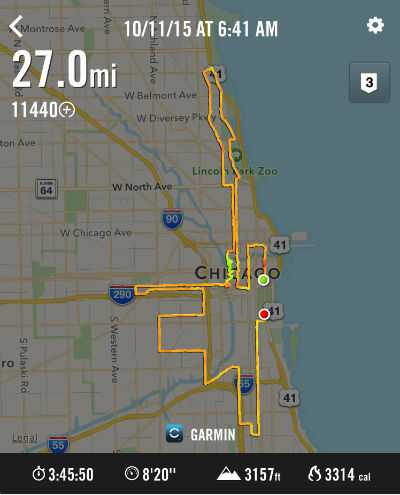 It’s pretty difficult to run the tangents at the Chicago Marathon. Mainly due to the crowds. Parts of the race get really congested as well. My watch bugged out and had me at 27.0 miles, but I suspect it was more around 26.5-26.6 miles. Keep this in mind if you’re shooting for a time goal. 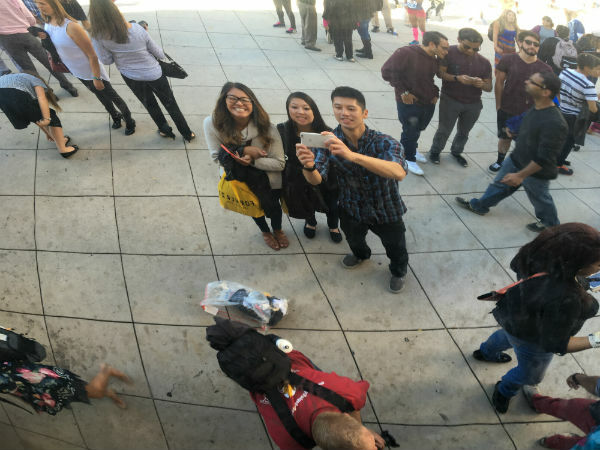 Chicago blew away all my expectations. It’s a race I’ll never forget. Most experiences come and go, but this one left imprints in me. Even though I’m thrilled with my result, I’ve come to realize marathons are much more than numbers. They’re really about testing your limits and potential. About not quitting when you want to the most. About finding strength you never knew you had to overcome what you thought was impossible. Training for and running a marathon is hard. Sometimes, it’s so terrible I question why I’m doing it. But each time I finish one, I find myself wondering “If I can do this, what else can I do?”. It’s extremely empowering and exhilarating. I often remind myself some miles will be good and some miles will be bad. You never know which one is coming, so smile and savor the good ones when they come. I know we did.